This Emerald diamond is 0.9 carat in weight, and comes with Good polish and Good symmetry, as verified from an independent gemological laboratory. The diamond is graded M in colour, and has a clarity grade of VS2. The diamond's GIA grading report number is 2181551232, which will detail further its specifications and measurements, and will also come with the purchase of the stone. AUD 43,465 Excl. Duties / Taxes. This Emerald diamond is 5.02 carat in weight, and comes with Excellent polish and Very Good symmetry, as verified from an independent gemological laboratory. The diamond is graded M in colour, and has a clarity grade of SI1. The diamond's GIA grading report number is 2193490775, which will detail further its specifications and measurements, and will also come with the purchase of the stone. This Emerald diamond is 0.75 carat in weight, and comes with Excellent polish and Very Good symmetry, as verified from an independent gemological laboratory. The diamond is graded M in colour, and has a clarity grade of VS1. The diamond's GIA grading report number is 1182458119, which will detail further its specifications and measurements, and will also come with the purchase of the stone. AUD 19,389 Excl. Duties / Taxes. This Emerald diamond is 3.01 carat in weight, and comes with Excellent polish and Very Good symmetry, as verified from an independent gemological laboratory. 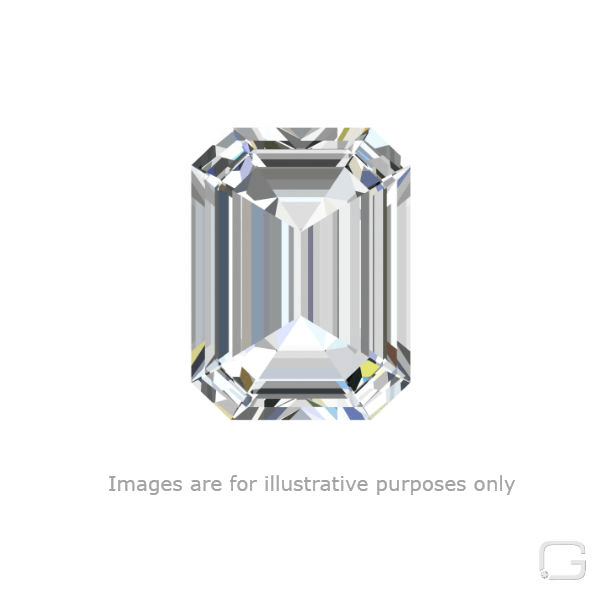 The diamond is graded M in colour, and has a clarity grade of VVS2. The diamond's GIA grading report number is 6197256984, which will detail further its specifications and measurements, and will also come with the purchase of the stone. AUD 6,327 Excl. Duties / Taxes. This Emerald diamond is 1.52 carat in weight, and comes with Excellent polish and Excellent symmetry, as verified from an independent gemological laboratory. The diamond is graded M in colour, and has a clarity grade of IF. The diamond's GIA grading report number is 2185226745, which will detail further its specifications and measurements, and will also come with the purchase of the stone. AUD 6,366 Excl. Duties / Taxes. This Emerald diamond is 1.51 carat in weight, and comes with Good polish and Very Good symmetry, as verified from an independent gemological laboratory. The diamond is graded M in colour, and has a clarity grade of VS1. The diamond's GIA grading report number is 2191694821, which will detail further its specifications and measurements, and will also come with the purchase of the stone. AUD 6,773 Excl. Duties / Taxes. This Emerald diamond is 1.7 carat in weight, and comes with Excellent polish and Very Good symmetry, as verified from an independent gemological laboratory. The diamond is graded M in colour, and has a clarity grade of VVS1. The diamond's GIA grading report number is 2193086708, which will detail further its specifications and measurements, and will also come with the purchase of the stone. AUD 6,458 Excl. Duties / Taxes. This Emerald diamond is 1.71 carat in weight, and comes with Excellent polish and Very Good symmetry, as verified from an independent gemological laboratory. The diamond is graded M in colour, and has a clarity grade of VS2. The diamond's GIA grading report number is 2191739882, which will detail further its specifications and measurements, and will also come with the purchase of the stone. AUD 9,028 Excl. Duties / Taxes. This Emerald diamond is 1.9 carat in weight, and comes with Excellent polish and Very Good symmetry, as verified from an independent gemological laboratory. The diamond is graded M in colour, and has a clarity grade of IF. The diamond's GIA grading report number is 7291150956, which will detail further its specifications and measurements, and will also come with the purchase of the stone. This Emerald diamond is 1.05 carat in weight, and comes with Very Good polish and Good symmetry, as verified from an independent gemological laboratory. The diamond is graded M in colour, and has a clarity grade of VVS2. The diamond's IGI grading report number is S3B86433, which will detail further its specifications and measurements, and will also come with the purchase of the stone. AUD 14,277 Excl. Duties / Taxes. This Emerald diamond is 2.6 carat in weight, and comes with Excellent polish and Very Good symmetry, as verified from an independent gemological laboratory. The diamond is graded M in colour, and has a clarity grade of VS1. The diamond's GIA grading report number is 7293253739, which will detail further its specifications and measurements, and will also come with the purchase of the stone. AUD 12,607 Excl. Duties / Taxes. This Emerald diamond is 2.5 carat in weight, and comes with Excellent polish and Excellent symmetry, as verified from an independent gemological laboratory. The diamond is graded M in colour, and has a clarity grade of VVS1. The diamond's GIA grading report number is 2195996239, which will detail further its specifications and measurements, and will also come with the purchase of the stone. AUD 2,790 Excl. Duties / Taxes. This Emerald diamond is 1.11 carat in weight, and comes with Excellent polish and Very Good symmetry, as verified from an independent gemological laboratory. The diamond is graded M in colour, and has a clarity grade of VVS2. The diamond's GIA grading report number is 6301395432, which will detail further its specifications and measurements, and will also come with the purchase of the stone. AUD 18,010 Excl. Duties / Taxes. This Emerald diamond is 3.03 carat in weight, and comes with Excellent polish and Excellent symmetry, as verified from an independent gemological laboratory. The diamond is graded M in colour, and has a clarity grade of SI1. The diamond's GIA grading report number is 5202136609, which will detail further its specifications and measurements, and will also come with the purchase of the stone. AUD 21,333 Excl. Duties / Taxes. This Emerald diamond is 3.21 carat in weight, and comes with Excellent polish and Excellent symmetry, as verified from an independent gemological laboratory. The diamond is graded M in colour, and has a clarity grade of IF. The diamond's GIA grading report number is 5181977080, which will detail further its specifications and measurements, and will also come with the purchase of the stone. This Emerald diamond is 1.06 carat in weight, and comes with Excellent polish and Excellent symmetry, as verified from an independent gemological laboratory. The diamond is graded M in colour, and has a clarity grade of VVS2. The diamond's GIA grading report number is 6301867771, which will detail further its specifications and measurements, and will also come with the purchase of the stone. AUD 5,806 Excl. Duties / Taxes. This Emerald diamond is 1.5 carat in weight, and comes with Very Good polish and Very Good symmetry, as verified from an independent gemological laboratory. The diamond is graded M in colour, and has a clarity grade of SI1. The diamond's GIA grading report number is 2191821676, which will detail further its specifications and measurements, and will also come with the purchase of the stone. AUD 2,500 Excl. Duties / Taxes. This Emerald diamond is 1.01 carat in weight, and comes with Excellent polish and Excellent symmetry, as verified from an independent gemological laboratory. The diamond is graded M in colour, and has a clarity grade of VS1. The diamond's GIA grading report number is 2316195368, which will detail further its specifications and measurements, and will also come with the purchase of the stone. AUD 2,150 Excl. Duties / Taxes. This Emerald diamond is 1 carat in weight, and comes with Excellent polish and Very Good symmetry, as verified from an independent gemological laboratory. The diamond is graded M in colour, and has a clarity grade of SI1. The diamond's GIA grading report number is 1323381359, which will detail further its specifications and measurements, and will also come with the purchase of the stone. AUD 17,278 Excl. Duties / Taxes. This Emerald diamond is 3.02 carat in weight, and comes with Excellent polish and Very Good symmetry, as verified from an independent gemological laboratory. The diamond is graded M in colour, and has a clarity grade of VS1. The diamond's GIA grading report number is 2191790160, which will detail further its specifications and measurements, and will also come with the purchase of the stone. This Emerald diamond is 3.02 carat in weight, and comes with Excellent polish and Very Good symmetry, as verified from an independent gemological laboratory. The diamond is graded M in colour, and has a clarity grade of SI1. The diamond's GIA grading report number is 1196832906, which will detail further its specifications and measurements, and will also come with the purchase of the stone. AUD 10,579 Excl. Duties / Taxes. This Emerald diamond is 2.01 carat in weight, and comes with Very Good polish and Very Good symmetry, as verified from an independent gemological laboratory. The diamond is graded M in colour, and has a clarity grade of VS2. The diamond's GIA grading report number is 6305270972, which will detail further its specifications and measurements, and will also come with the purchase of the stone. AUD 19,384 Excl. Duties / Taxes. This Emerald diamond is 3.01 carat in weight, and comes with Excellent polish and Excellent symmetry, as verified from an independent gemological laboratory. The diamond is graded M in colour, and has a clarity grade of VS1. The diamond's GIA grading report number is 2195343784, which will detail further its specifications and measurements, and will also come with the purchase of the stone. AUD 16,838 Excl. Duties / Taxes. This Emerald diamond is 3.19 carat in weight, and comes with Excellent polish and Very Good symmetry, as verified from an independent gemological laboratory. The diamond is graded M in colour, and has a clarity grade of SI1. The diamond's GIA grading report number is 6295593443, which will detail further its specifications and measurements, and will also come with the purchase of the stone. AUD 19,604 Excl. Duties / Taxes. This Emerald diamond is 3.55 carat in weight, and comes with Good polish and Good symmetry, as verified from an independent gemological laboratory. The diamond is graded M in colour, and has a clarity grade of SI1. The diamond's IGI grading report number is 296789153, which will detail further its specifications and measurements, and will also come with the purchase of the stone. AUD 28,631 Excl. Duties / Taxes. This Emerald diamond is 4.08 carat in weight, and comes with Excellent polish and Excellent symmetry, as verified from an independent gemological laboratory. The diamond is graded M in colour, and has a clarity grade of VS1. The diamond's HRD grading report number is 180000082620, which will detail further its specifications and measurements, and will also come with the purchase of the stone. This Emerald diamond is 0.53 carat in weight, and comes with Good polish and Fair symmetry, as verified from an independent gemological laboratory. The diamond is graded M in colour, and has a clarity grade of VS2. The diamond's GIA grading report number is 2191903042, which will detail further its specifications and measurements, and will also come with the purchase of the stone.